Today we encountered a very strange issue. One of our clients' ASP.NET based website was running really slow, at least on one of the two servers it is running on. And by slow I mean it was almost unreachable. Some inspection on the issue showed us that the CPU load on the affected server was somewhere between 95% and 100%. The uptime of the site on this server was some days. And before that the site was already running for some weeks without any problems. So why should something like that happen out of a sudden? Well, as we later found out, it had something to do with thread safety of Dictionaries. But first things first: ASP.NET websites running under IIS are multithreaded by default. What this means is that the execution of the code is asynchronous and simultaneous. What happened in our case is the following: We have a class (let's call it SomeContainer) that has a static property that is of type Dictionary. Each time this property is accessed it is referencing the exact same instance - that's just what we want to achieve with this approach. But the way dictionaries are designed they were not meant for this scenario of reading and writing concurrently. 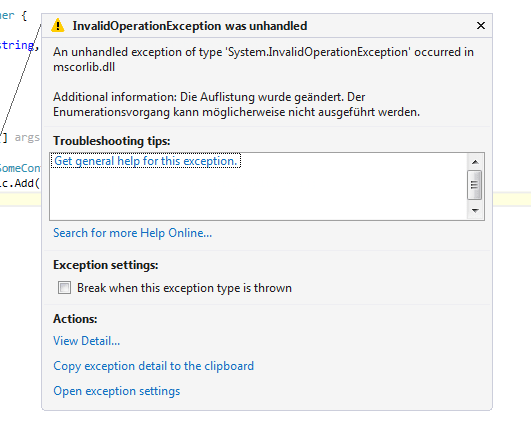 When the entries in a Dictionary change while they are being iterated over, an InvalidOperationException will be thrown saying that the Collection was modified; enumeration operation may not execute. and the iteration steps on to the next entry - where the Exception is thrown again - and so on. You get the point. This happens endlessly causing a deadlock. The high CPU load only seems to be a symptom, not the problem itself. This is our container. As you can see it's got one initial entry so there's something to loop over. The easiest way to provoke this error is to add a new entry while iterating over the dictionary. This will immediately throw an InvalidOperationException. And another one. And even another one. Have a look at the CPU load of this program. So much for theory. Next we'll construct the rare case that two threads read and write to the dictionary at the same time. For this I'm simply spawning two threads, one that iterates over the dictionary and one that adds new entries to it. As this case is really rare, I've added some concurrency so that the chance for the threads to access at the same time increases. So what did we do to prevent this happening again? Luckily, there's a thread save implementation for dictionaries called ConcurrentDictionary that can be used as a drop in replacement.